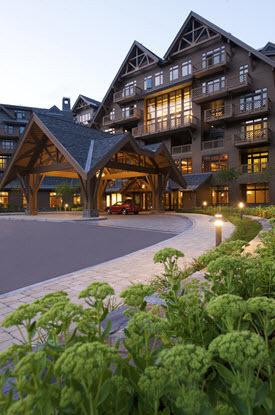 Spruce Peak (formerly Stowe Mountain Lodge) is located in the quintessential New England town of Stowe, VT. Stowe not only impresses guests with its rich historical roots, but it also boasts some of the most impressive natural landscape in the country. With a variety of gourmet artisan restaurants and food shops, wine tastings, high-end boutiques and quaint walking village, Stowe is home to many luxuries which complement the four-diamond Spruce Peak. Conveniently located to the largest markets on the East, Spruce Peak provides all the benefits of a destination resort with incredible accessibility. Stowe is just a short 3-hour drive from Boston, and only 45-minutes from Burlington International Airport-hosting non-stop flights from New York City, Washington DC, Montreal, Chicago and many other destinations. Follow Airport Drive and turn left onto US-2/Williston Road. Turn right onto VT-2A/St. George Road and follow for approximately 1 mile. Merge onto Interstate 89 South for approximately 20 miles. Take exit 10 (Stowe/Waterbury exit) and turn left onto VT-100N. Follow this for 11 miles until you reach the stop sign with flashing light. This is the center of Stowe Village. Make a left at the stop sign onto Route 108N (Mountain Road), and follow this for approximately 7.5 miles up the mountain. Spruce Peak will be on your right-hand side. Please call 802-253-3560 to arrange for private airport transfer services. Taxi services and car rentals are also available at the airport. Take Interstate 93 North to Concord, NH and then follow signs to connect with Interstate 89 North. Follow Interstate 89 North through New Hampshire and into Vermont until you get to exit 10 (Stowe/Waterbury exit). Make a right at the end of the exit ramp; this is VT-100N. Follow this for 11 miles until you reach the stop sign with flashing light. This is the center of Stowe Village. Make a left at the stop sign onto Route 108N (Mountain Road), and follow this for approximately 7.5 miles up the mountain. Spruce Peak will be on your right-hand side. Take Interstate 95 North in Providence and follow it to Interstate 93 North outside of Boston. Continue on with the directions from Boston listed above. Follow Highway 10 East to Highway 35 South. Take 35 South to Iberville and then pick up Route 133 South and follow it to the US/Canada border. Next follow Interstate 89 South to exit 10 (Waterbury/Stowe exit). Make a left at the end of the exit ramp; this is VT-100N. Follow this for 11 miles until you reach the stop sign with flashing light. This is the center of Stowe Village. Make a left at the stop sign onto Route 108N (Mountain Road), and follow this for approximately 7.5 miles up the mountain. Spruce Peak will be on your right-hand side. Follow Interstate 87 North to exit 20 (Fort Ann exit). Follow signs for Route 149 East and take this to Fort Ann NY. At the light in Fort Ann, make a left onto Route 4 East and stay with this until you reach Rutland, Vermont. Once in Rutland, you will join Route 7 North for a few miles until you can rejoin Route 4 East again. Look for signs that direct you back onto Route 4 East after about 2-3 miles. Take Route 4 East to Route VT-100N and then Route 107 North. This will take you to Interstate 89. Join Interstate 89 North at this point and take this to exit 10 (Stowe/Waterbury exit). Make a right at the end of the exit ramp; this is Route VT-100N. Follow this for 11 miles until you reach the stop sign with flashing light. This is the center of Stowe Village. Make a left at the stop sign onto Route 108N (Mountain Road). Spruce Peak will be on your right-hand side. From New York City, Philadelphia, or Washington D.C. Follow Interstate 95 North to New Haven, CT which will connect with Interstate 91 North. Follow Interstate 91 North through Hartford, across Massachusetts, and up to White River Junction, VT. Follow signs to connect with Interstate 89 North and take that to exit 10 (Waterbury/Stowe exit). Make a right at the end of the exit ramp; this is VT-100N. Follow this for 11 miles until you reach the stop sign with flashing light. This is the center of Stowe Village. Make a left at the stop sign onto Route 108N (Mountain Road), and follow this for approximately 7.5 miles up the mountain. Spruce Peak will be on your right-hand side.